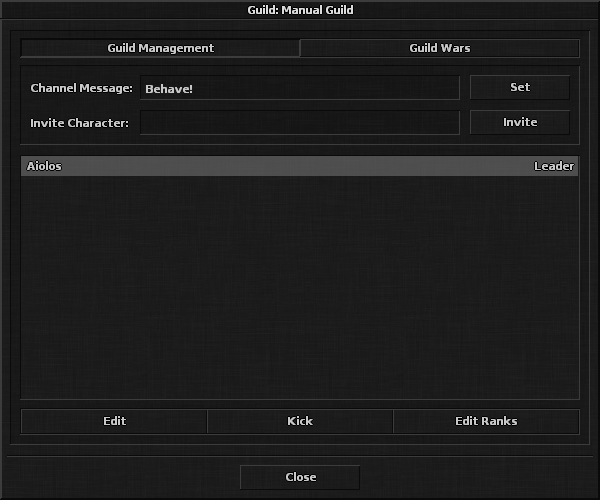 In the Guild Management tab you can see a list of the guild's members and the current channel message. Members who have a rank with guild leader permissions may change the channel message and edit ranks by pressing the Edit Ranks button on bottom right. Members who have a rank with at least vice-leader permissions may also invite new players to the guild. Note that guilds are limited to 200 members, including invites. To edit a member's title, rank or to kick them, first select the member from the list and then click on Edit or Kick. A guild member can always kick themselves, regardless of rank, unless the guild is in a war with loyalty code enabled. To kick or edit other members, leader or vice-leader permissions are required, and the edited member must be of a lower rank position than yourself. However, rank position 0 guild leaders may also edit or kick each other. Note that if a guild leader is kicked out of the guild and no guild leaders remain, the guild will be automatically disbanded!